April 18, 2019 – The Court hearing the CTI Foods cases confirmed the Debtors' Joint Prepackaged Chapter 11 Plan and Disclosure Statement [Docket No. 177]. 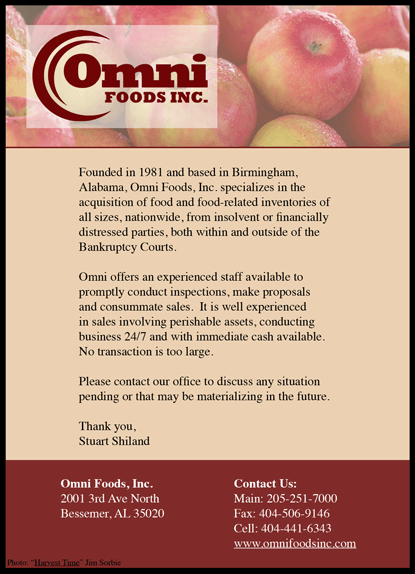 On March 11, 2019, CTI Foods, LLC and its affiliated debtors, filed for Chapter 11 protection with the U.S. Bankruptcy Court in the District of Delaware, lead case number 19-10497…. April 16, 2019 – Further to the Debtors’ March 15, 2019 motion [Docket No. 148], the Court hearing the Decor Holdings cases issued an order (ii) approving the adequacy of the Debtors’ Disclosure Statement, (ii) authorizing the Debtors’ proposed solicitation and Plan voting procedures and (iii) scheduling a May 2, 2019 confirmation hearing [Docket No….